Total: 2 hr 20 Min. | Active: 20 Min. The original recipe with guaranteed success is for 6 portions. Altering the number of portions may result in alternate results. Please note that the existing quantities are not automatically adjusted in the text. Which one do you want to print / save? Cut 6 thin strips off the mango, drizzle with lemon juice, cover and chill to use as decoration. Cut the rest into pieces and place in a pan. Stir in the icing sugar. Simmer, stirring, for approx. 1 min., puree and cool completely. Stir in the lemon juice. Set aside 1 tbsp of mango pieces and 1 tbsp of chocolate pieces for the decoration. Mix the rest into the mango puree with the Ricotta. Carefully fold in the whipped cream. Put the madeleines in the glasses and drizzle with orange juice. Spoon the mango crème on top. Cover the dessert and leave to chill for approx. 2 hrs. 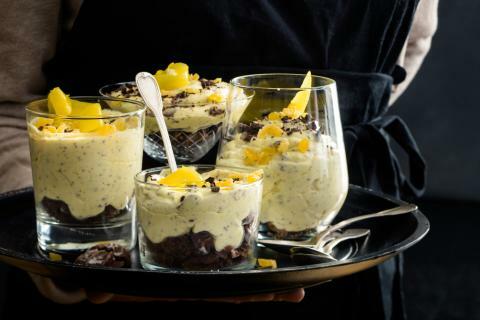 Decorate the mango tango with the reserved mango slices, mango and chocolate pieces. Simply coloured eggs for Easter? Try our Easter recipes to surprise your loved ones with something extra special – from cakes and roasts to seasonal veggies.